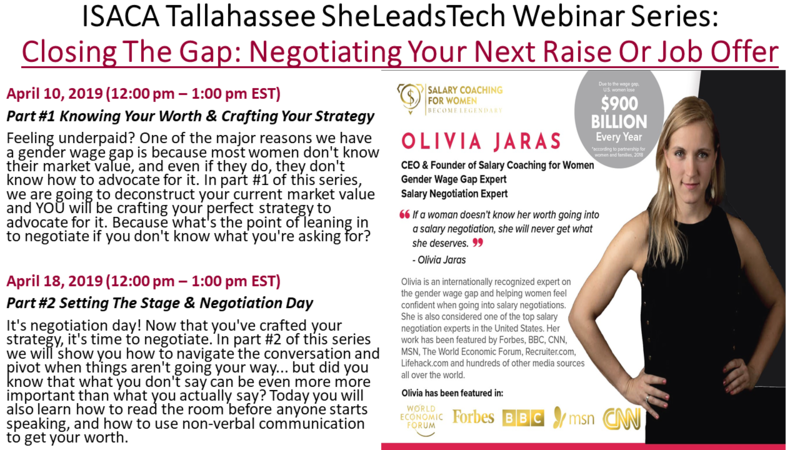 ISACA Tallahassee Chapter's SheLeadsTech program has teamed up with Olivia Jaras, MBA, to bring you a two part webinar workshop series, "Closing the Gap: Negotiating Your Next Raise or Job Offer"​. We are pleased to promote this webinar to our Greater Kansas City Chapter ISACA members! In part #1 of this series, we are going to deconstruct your current market value and YOU will be crafting your perfect strategy to advocate for it. Because what's the point of leaning in to negotiate if you don't know what you're asking for? Login: IF YOU HAVE REGISTERED FOR AN ONLINE EVENT, A NOTIFICATION WILL BE SENT 24 HOURS AND 1 HOUR PRIOR TO THE START OF THE EVENT. PLEASE ADD SUPPORT@PEACHNEWMEDIA.COM TO YOUR SAFE LIST TO RECEIVE THESE NOTIFICATIONS.